With most of us leading such busy lives it can be hard at times to cook a fresh, healthy and tasty meal for dinner time. In a lot of instances it leads to many of us going for the easier and unhealthy option of ordering a chinese or pizza. If this is you, then you may be interested in a slow cooker. It’s unbelievable to some how a slow cooker is the perfect kitchen appliance for those with little time to spare to prepare a home cooked meal every day of the week. Slow cookers are the ultimate convenience kitchen appliance and are often referred to as “set and forget” cookers as you don’t need to keep an eye on them while they work their magic. Simply prepare your ingredients and chuck them in the slow cooker in the morning, set the timer and walk through the door after work to the smell of a fresh home cooked meal. In our ultimate gude to the best slow cooker Australia 2019 has to offer we will be sharing all the important information you need to know for when buying as well as bringing you the top 10 best models in our slow cooker reviews. 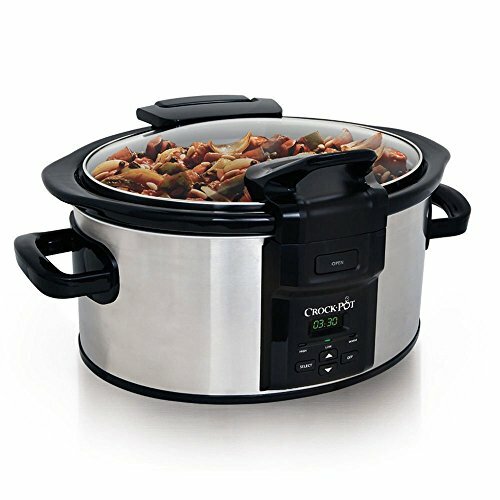 For those that are in a hurry to buy a slow cooker and just want to know what are the best models available to buy, check out our comparison table below. 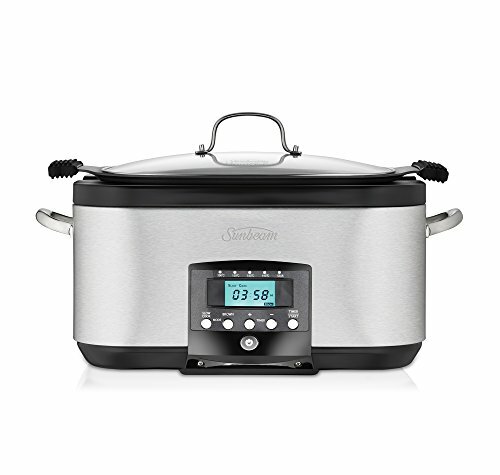 Here you can compare slow cooker features and prices. 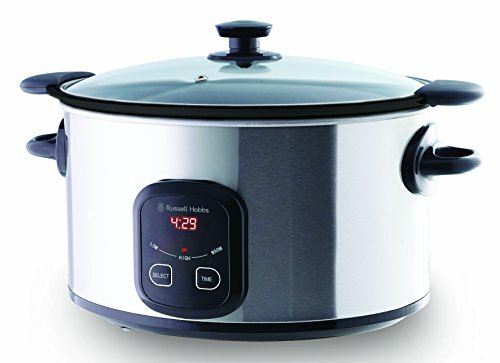 Before buying a slow cooker there are a few things worth knowing about, especially if you are to buy the best model for your needs and budget. 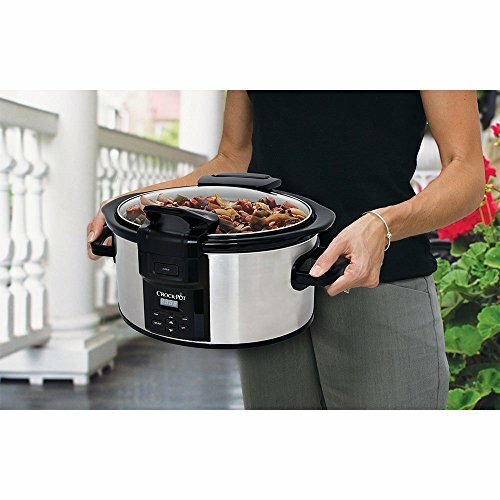 Slow cookers come with a number of features and not all slow cookers are the same. The difference between cheap slow cookers and more expensive options differs vastly. That’s not to say that there aren’t some very good best cheap slow cookers available to buy, you just need to know what to look for when buying. As you can probably tell by the name a slow cooker is exactly that, a kitchen appliance that cooks or simmers food at low temperatures. Due to the low cooking temperature flavour is intensified offering richer flavours and very tasty meals. Another name for a slow cooker is a crock pot, whether you use this term or not depends on where you live. 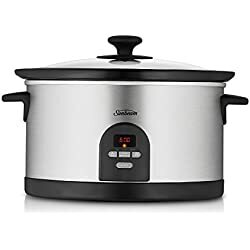 However, a crock pot was a name given to a slow cooker by the Sunbeam brand and the term has stuck. 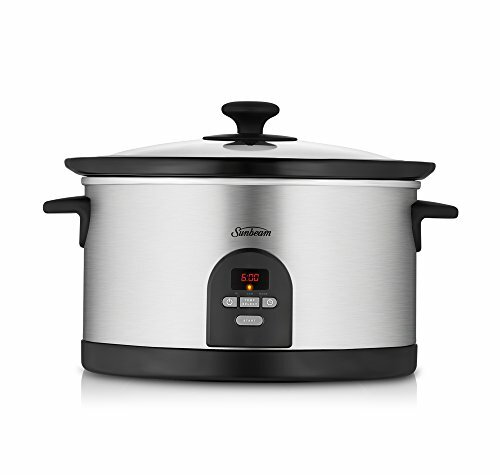 You can find the best crock pot slow cooker in our review section. 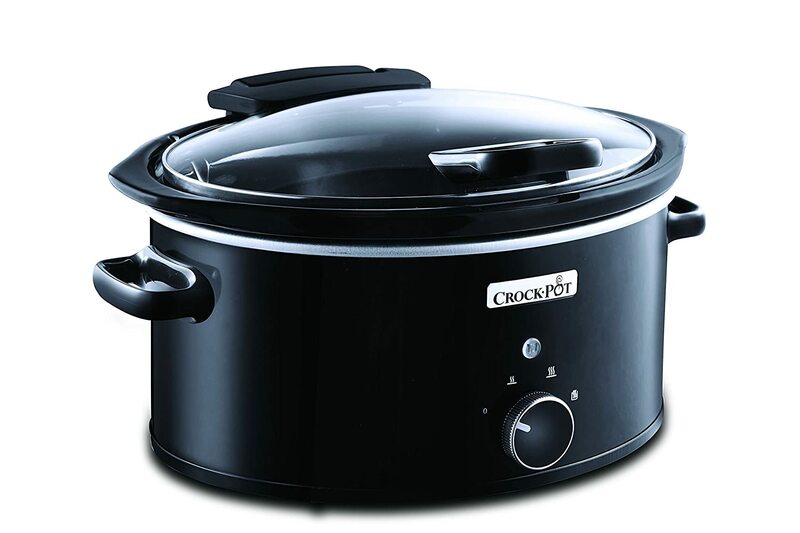 The Crockpot brand is regarded as one of the best slow cooker brands in the world. 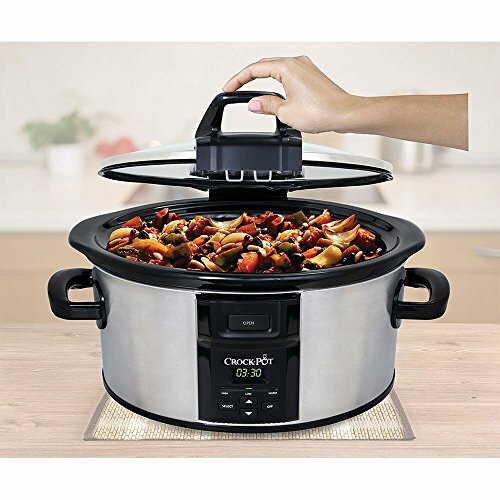 In terms of looks, a slow cooker can be described as a dish with a lid and depending on the price it could have a number of different features and settings, more of which we will go into in our best slow cooker in Australia buyers guide. 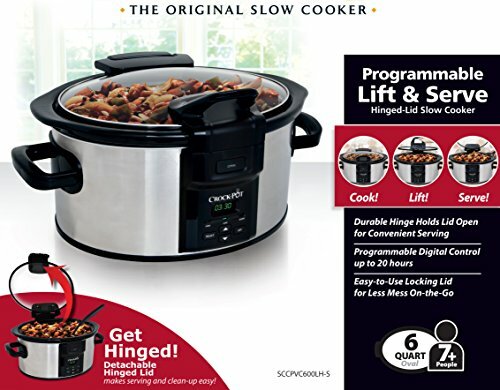 Essentially speaking there is only one type of slow cooker, however, there are other kitchen cooking appliances that have a slow cooking feature. The slow cooking feature can be found mainly in the all-in-one cookers as an addition to the pressure cooking and frying features they have. 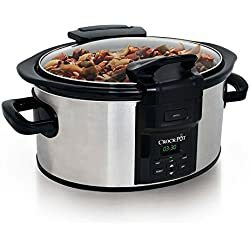 If you do opt for an all in one cooker with a slow cooking feature, you will have to pay considerably more than if you just buy a traditional slow cooker. The benefit of all in one cookers is that you don’t have to have a handful of different kitchen appliances all over the kitchen worktop. The best digital slow cooker offers great versatility in the kitchen. Generally speaking most slow cookers come with 3 heat settings which are funnily enough fast, slow and auto. Personally I wouldn’t recommend using the fast heat setting as it tends to leave food lacking in flavour, especially when compared to the slow setting. The slow heat setting does an excellent job at locking in flavour and cooking meat to the point it is that tender that it almost melts in the mouth. This should be obvious but you would be surprised how many people never check the warranty when buying electrical equipment. The best value slow cooker will come with a standard warranty of 12 months. 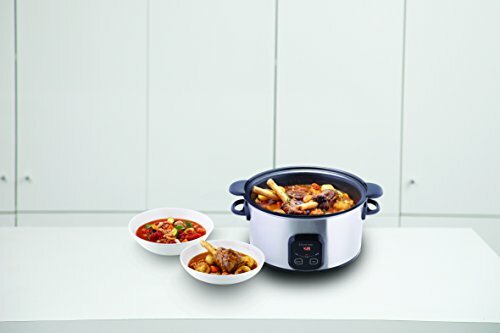 When you get into the top slow cookers 2019, you are looking at getting an extended warranty of at least 2 years. Remember to always check the warranty when buying your best electric slow cooker. 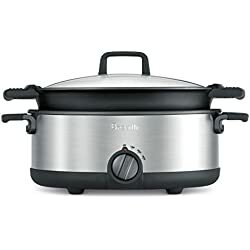 Now that you know all the information you need to know for when buying the best slow cooker 2019, its time to take a look at the top rated slow cookers in our slow cooker reviews. In our search for the best model we have brought you a mix of affordability and quality in our top 10 list as the most expensive model isn’t always the best. We also took previous buyers feedback into consideration as this is generally a very good indicator of how good a product is. We have all heard of Russell Hobbs and we all know that they have an excellent reputation for consistently producing high quality kitchen appliances. The Russell Hobbs 6L Searing Slow Cooker is a great little machine and it comes with excellent feedback from previous buyers and in slow cooker reviews 2019. With a whopping 6 litre capacity it comes recommended as one of the best family slow cooker on the market. In total there are 3 temperature settings these are low, high and the auto setting, which chooses the best temperature for the food you are cooking. The built-in timer allows you to have piping hot food ready as soon as you get home from a hard days work. 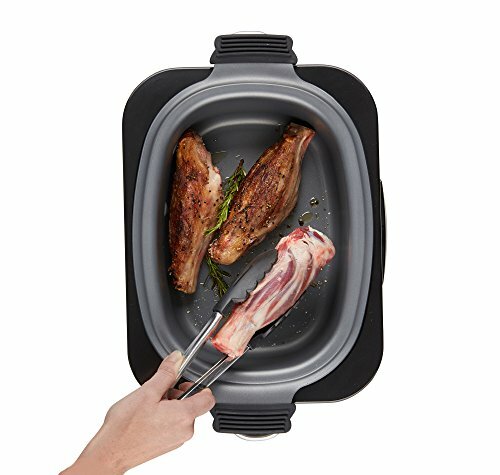 For those that are really hard pressed for time the ceramic inner bowl is dishwasher proof making cleaning this slow cooker an easy job. This model comes highly recommended and for the price you can’t complain, it is far cheaper than some other models with the same features. Sunbeam slow cookers rank high in many of the best slow cooker reviews Australia has. With excellent customer feedback and a 5 star rating on Amazon the Sunbeam Secretchef Electronic Slow cooker comes with good recommendations. With a 5.5 litre capacity it makes a good slow cooker for a medium to large family. 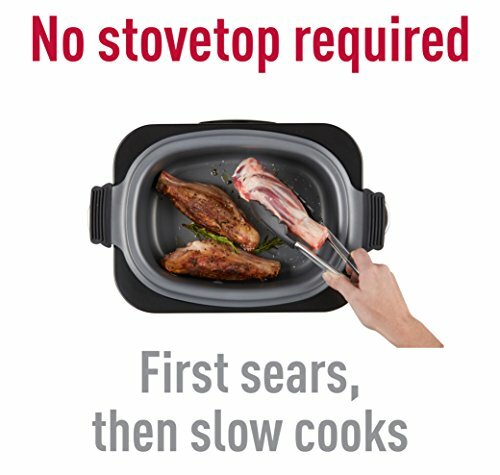 Customer reviews speak highly of the sear function which helps to reduce cooking times, simply sear your meat for a few minutes, before switching to the slow cooker setting. The LCD display is bright and clearly shows all the settings and functions. Simple to use and easy to navigate through the settings, it won’t be long before you fully get the hang of the LCD display. As with all the best models there is an automatic keep warm setting and a countdown timer, which lets you know when your meal is cooked and ready to dish up. To sum up this is one of the best slow cookers in Australia and without doubt one of the best models to buy for family use. If customer reviews are anything to go off, they usually are, then you can’t go wrong with the Sunbeam Secretchef. 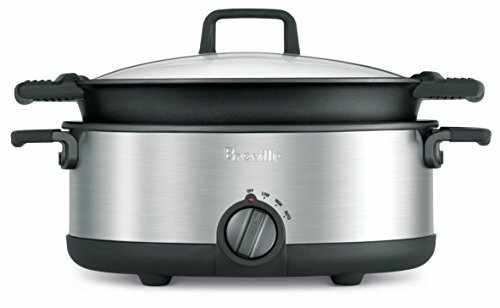 Another contender for the number one spot in large slow cooker reviews is the Breville Fast Slow Cooker. With a very impressive 6 litre capacity this is another good choice for those with large families with healthy appetites. 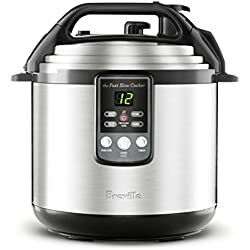 It is one of the more expensive options in our reviews, the reason for this been that it is very versatile having slow cooking, pressure cooking and steam cooking functions, making it more of a multi cooker. 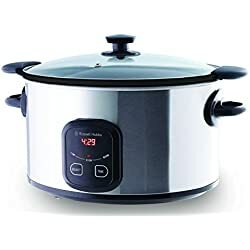 The reason we have included it in our best slow cooker Australia reviews is due to the amount of positive customer reviews highlighting the slow cooker function and how good it actually is. The slow cooking function when on its lowest setting receives much praise for the tenderness of the meat it cooks. If you are looking for a top of the range model with other functions beside slow cooking this is the one. 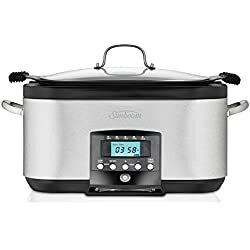 Strictly speaking this is not a slow cooker, however, with the slow cooking feature said to be better than most slow cookers it might be worth checking out. When i was a kid i remember my Grandma having a CrockPot slow cooker and her stew and dumplings were and still is the best meal i have ever had cooked in a slow cooker. 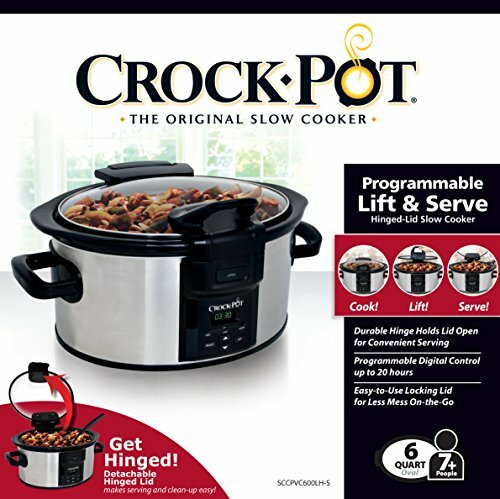 The model featured is the Crockpot Lift & Serve Slow Cooker and as with all CrockPots it is pretty good. It features a large 5.7L capacity and has 3 heat settings. Due to it been oven proof you can add the finishing touches to certain meals by placing it under the grill. One meal where i always have to put my slow cooker under the grill is with cauliflower cheese, it just isn’t the same without a crispy surface. One feature where this CrockPot differs slightly is the lid. It comes with a hinged lid which may or may not be to your liking. It does eliminate having to put the lid on a work surface which depending on what you are cooking can leave a right mess. On the flip side it might be a little harder to clean than a model with an unhinged lid. Large 5.7L capacity can feed up to 6 people. Prep your ingredients, set the timer, forget and come home to a family dinner. 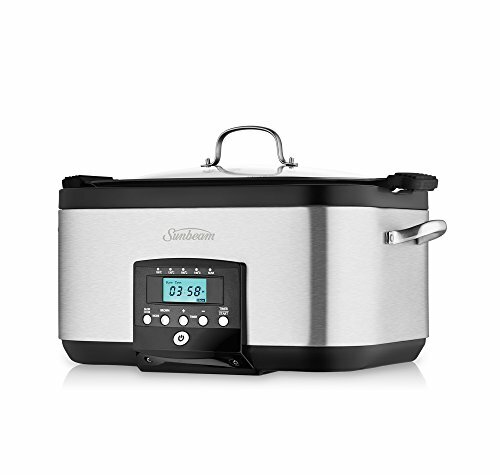 Another model from the Sunbeam brand and this time it’s the Sunbeam Electronic Slow Cooker. This is the budget model in the Sunbeam range and like pretty much all of their products, it comes with a five-star rating from previous buyers on Amazon. To start off it has a very generous 5.5 litre capacity, which as you probably know by now is ideal for large families. In total there two heat settings and a keep warm setting of 12 hours. Most noteworthy is the wrap-around heating method, this ensures an even distribution of heat throughout the cooking pot. Consequently, food is evenly cooked and unlike with some budget models, there is no burning or sticking to the bottom. For ease of cleaning both the lid and removable dish are dishwasher proof. In addition the cord can also be removed which makes table serving far more convenient. 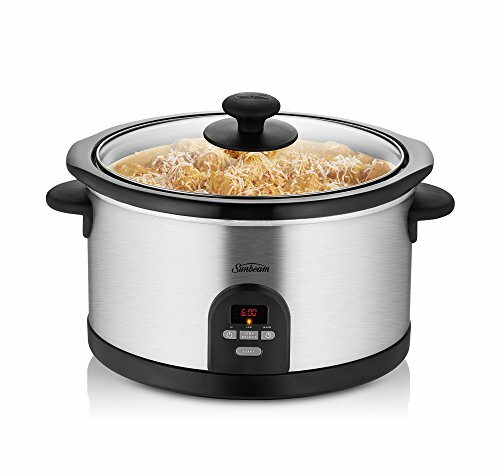 As expected from the Sunbeam brand this slow cooker offers excellent value for money. 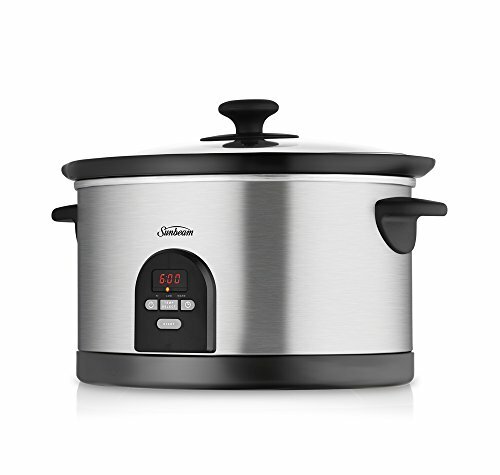 With a good mix of quality and affordability this is probably the best price slow cooker Australia has to offer. Another very popular model from the Breville brand and this time its the Breville Flavour Maker Slow Cooker. Why is it called the flavour maker? 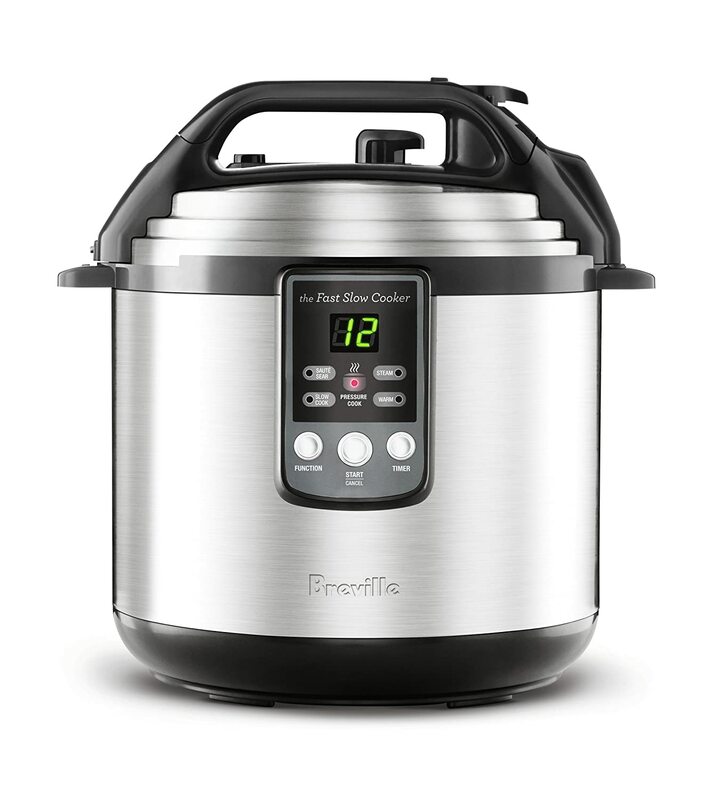 The searing feature of this model comes with good recommendations and is the reason why it ranks high in so many slow cooker reviews as it locks in the flavour making it perfect for casseroles and stew and dumplings. With a whopping 7 litre capacity it is one of the biggest models in our reviews and as you might have guessed by now it is perfect for large families. It comes with 3 heat settings and features a wrap around heating element ensuring food is evenly cooked throughout. Easy to clean and use, this is a no-nonsense model with all the standard features you would expect to get with a very good model. If you are anything like me then you will love a good meal that has been slow cooked to perfection. 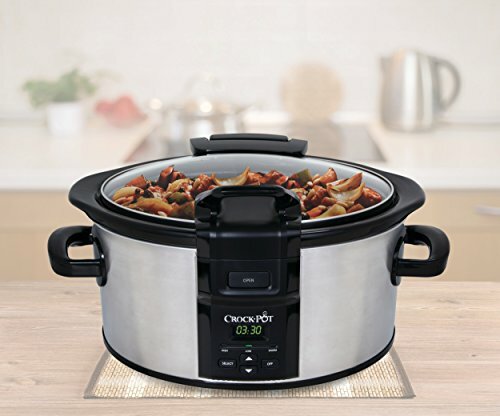 Hopefully, with the help of our short buyers guide and our choices of the best slow cooker Australia has to offer, you have managed to find a model that is perfect for you and your culinary needs. More Kitchen Appliances you may be interested in.